ALTAFLORA - probiotics and gastrogel. - Altaflora - new generation sachets against diarrhoea. Diarrhoea attacks have been always treated with diarrhoea sachets containing the electrolytes sodium, potassium and magnesium. These diarrhoea sachets have been taken generation after generation with the purpose of replacing the electrolytes that have been lost. Studies today show that during diarrhoea not only are the electrolyte salts lost, but also the good bacteria that live in the intestine, better known as the flora. So sachets containing just electrolyte salts are not enough and it is a must to take sachets containing both flora and electrolytes. Sachets containing just electrolytes are old generation, whereas the new generation sachets are the sachets containing both electrolytes and the good bacteria (flora). 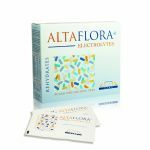 Altaflora electrolyte sachets have the advantage of having both the flora and electrolytes in one sachet. Altaflora sachets are the new generation diarrhoea sachets.